I am not looking to get it “just right”, in perfect equipoise. I fight. It’s a battle, always a struggle. Oh yes, just as we do for real. – There is no place where it stops, a peace zone? There are sometimes accommodations, there is repentance, there are come-backs, scrubs, erasures, the discovery of the underlying first coat. But, overall, between colors, it’s a struggle and it’s a fight without mercy. 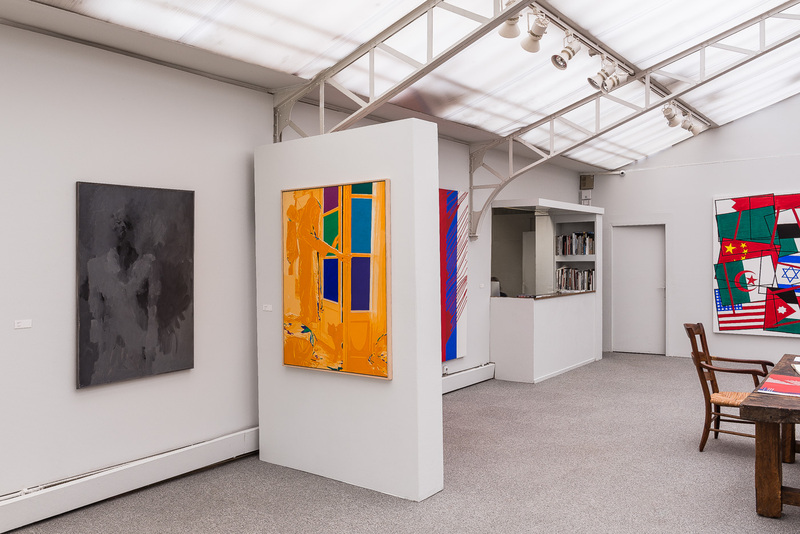 On the occasion of the publication of Laurent Greilsamer’s book, published by Editions Gallimard Fromanger – De Toutes les Couleurs, in collaboration with Caroline Smulders, the Jeanne Bucher Jaeger gallery has organized an exhibition dedicated to the artist, showing works from 1962 to 2017. 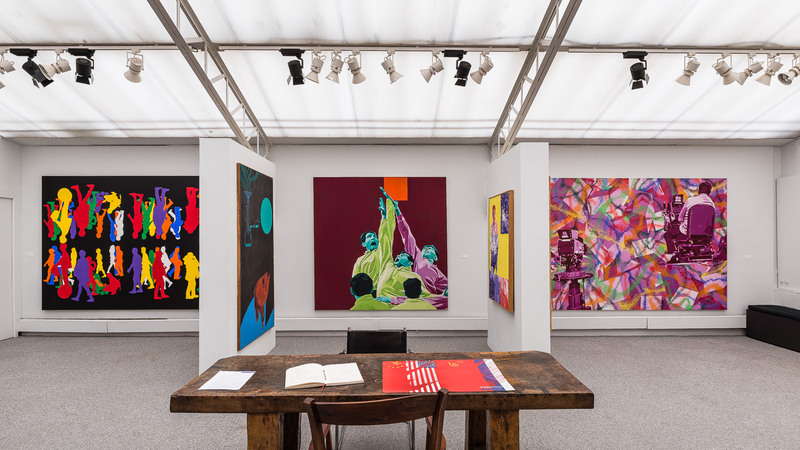 The exhibition takes place more than forty years after the artist’s last personal exhibition at the gallery, in 1977. At the time, the series Questions was showcased. 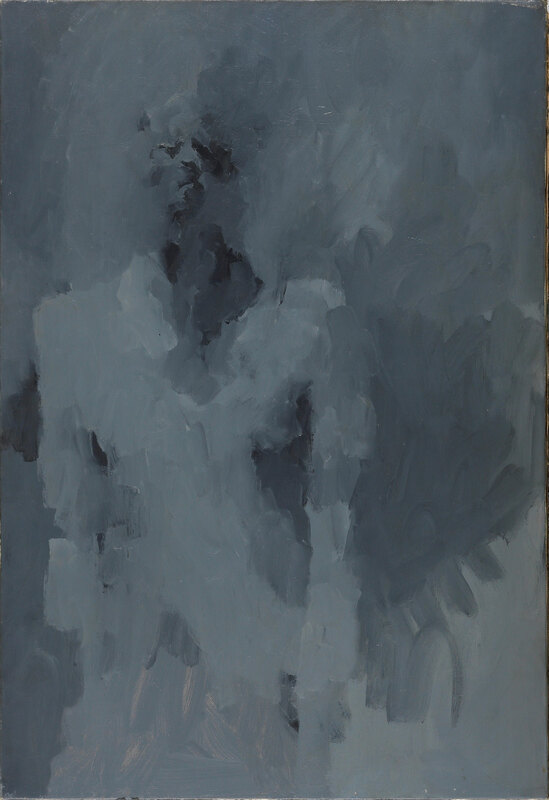 The starting point of the exhibition is Autoportrait from 1962, emblematic of the «gray» period, in the wake of Alberto Giacometti, his first master, who, with Jacques Prévert, introduced Fromanger to Aimé Maeght. Maeght became his gallery but a fire in the workshop in 1964 and the disappearance in the flames of 80 paintings marked the end of this period. In the gray of these ashes the fire had left a small purple glow … which soon will become a new flame that enters his paintings. (Jacques Prévert). 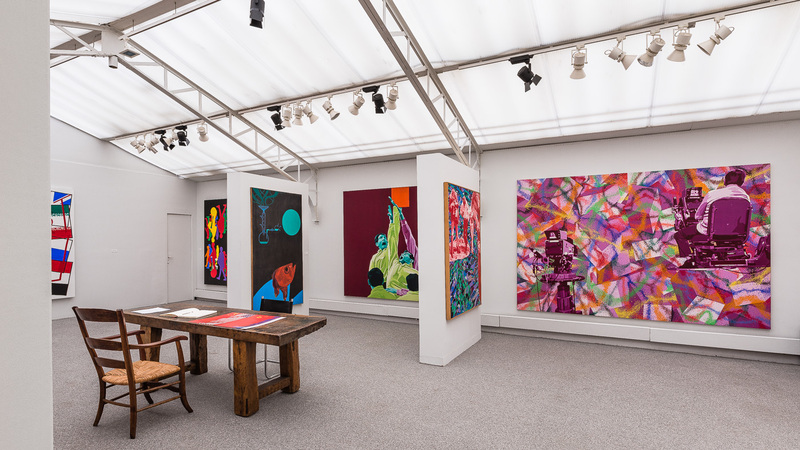 From black and white, Gérard Fromanger switched to color. 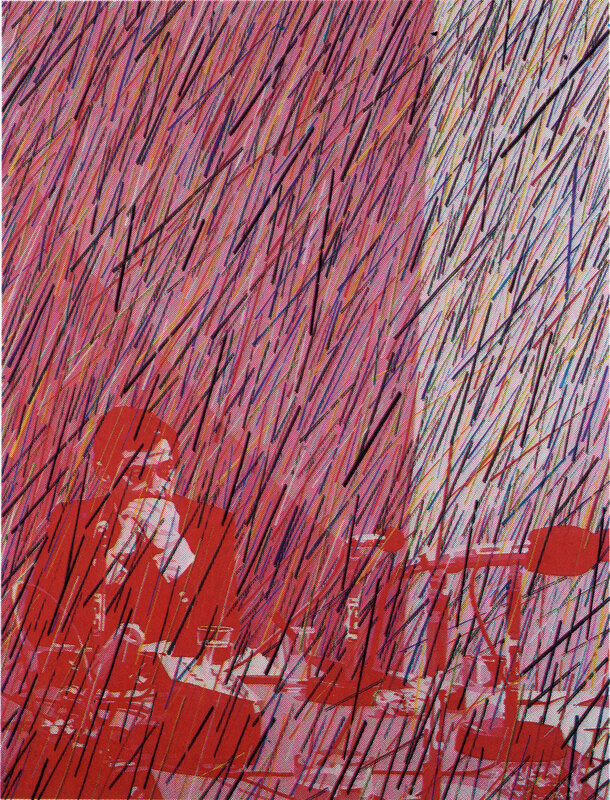 The first red appeared in 1964 in the series Pétrifiés with Première ombre au tableau, a reference to Duchamp. La conquête de l’impossible from 1964 and Y’a d’l’eau dans l’gaz from 1965 also belong to this series. For these compositions, the artist chose a dark cadmium red. The light red was too kind, too sunny, too charming, too positive, too childish. As he said at the time, I take the darkest cadmium because it is harsher, cleaner, more what I am after. Painting needs nothing, only the bare necessities, it must not give in to charm, decoration, demagogy, compromise and perfidy (…). The year 64 shook art history with the consecration of an American in Venice, Robert Rauschenberg. Its European counterpoint started in October 64 with the exhibition Mythologies quotidiennes dedicated to the Figuration narrative. Gérard Fromanger would become one of movement’s leading figures. France was on the verge of cultural asphyxiation when Gérard Fromanger accompanied the journalist Mo Teteilbaum to the University of Nanterre on May 3, 1968. 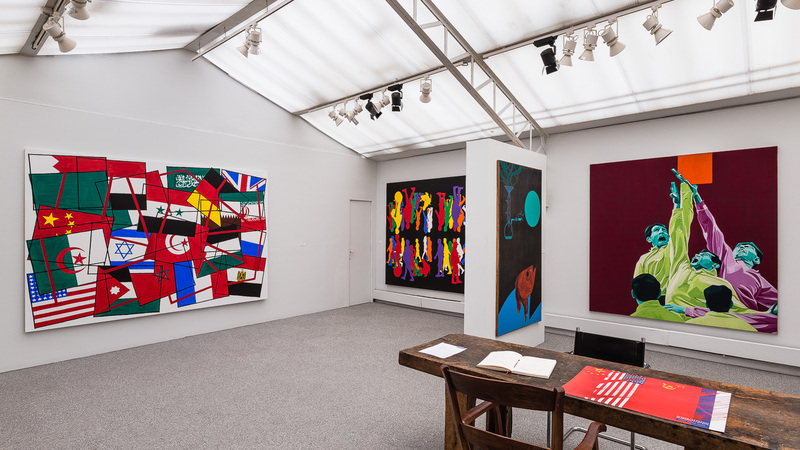 On the night of May 14 to 15, the Atelier Populaire at the Beaux-Arts was born with the complicity of the painters Aillaud, Arroyo, Buraglio, Jolivet, Le Park etc. 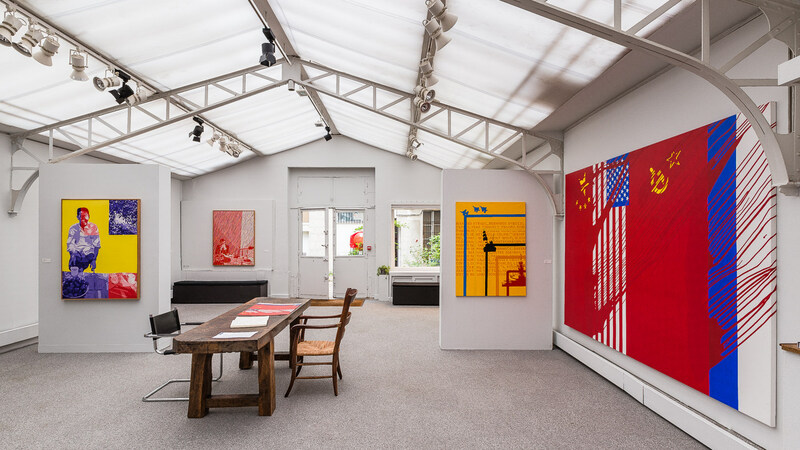 : they would close the atelier with a final poster, following the evacuation of the Beaux-Arts by the police at the end of May: The police took over the Beaux-Arts, so the Beaux-Arts took to the street. In this environment, nine monumental sculptures in Plexiglas were created. They were called the Souffles, and were exhibited in front of the Alésia church in Paris, on October 12, 68, each sculpture named after cities of workers’ revolts (Souffle of Caen, Sochaux etc. ), students` revolts (Souffle of Paris, Rome, Berlin etc.) or friends (Souffle of Florence, Chantal, Isabelle etc.). 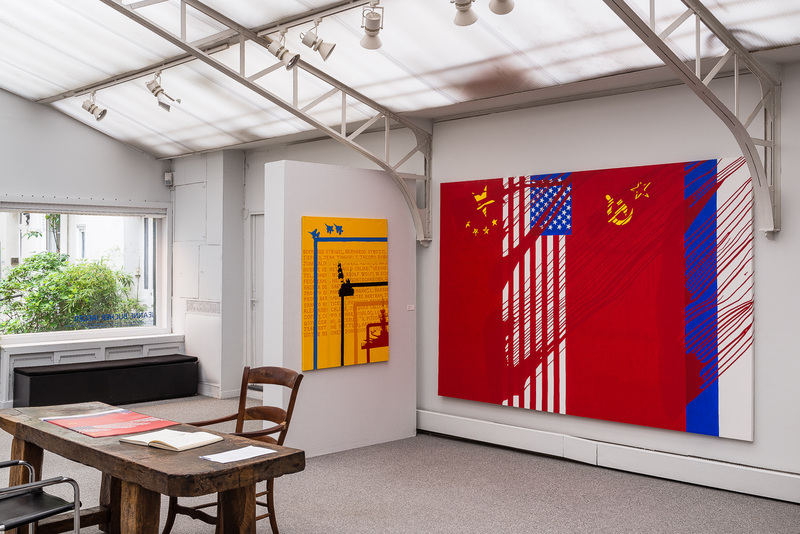 In 74, Gérard Fromanger embarked for China, together with a group of artists and intellectuals. 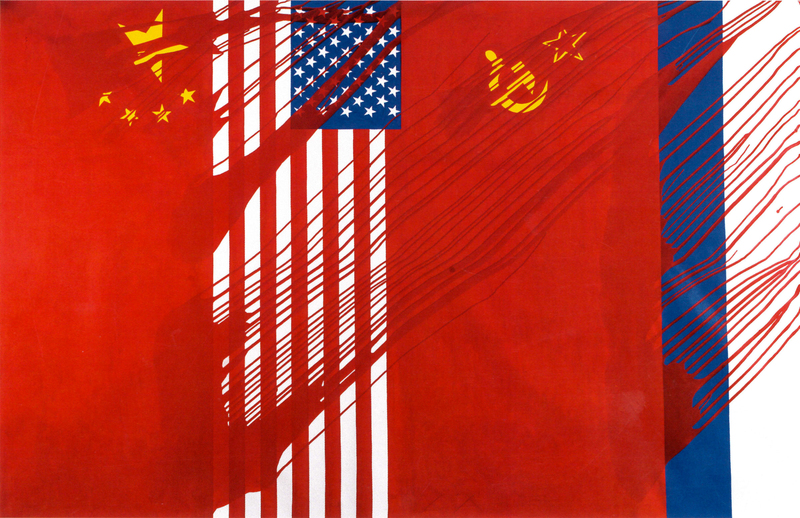 That was the second trip authorized after the recognition of China by De Gaulle. 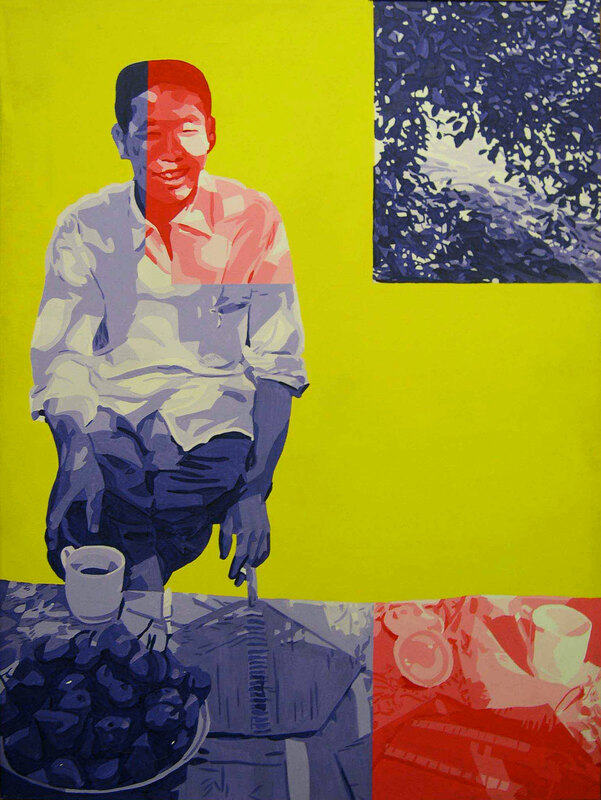 From this trip a series inspired by peasant painters emerged, including En Chine à Lo Yang (from the series Le Désir est Partout), 1974. 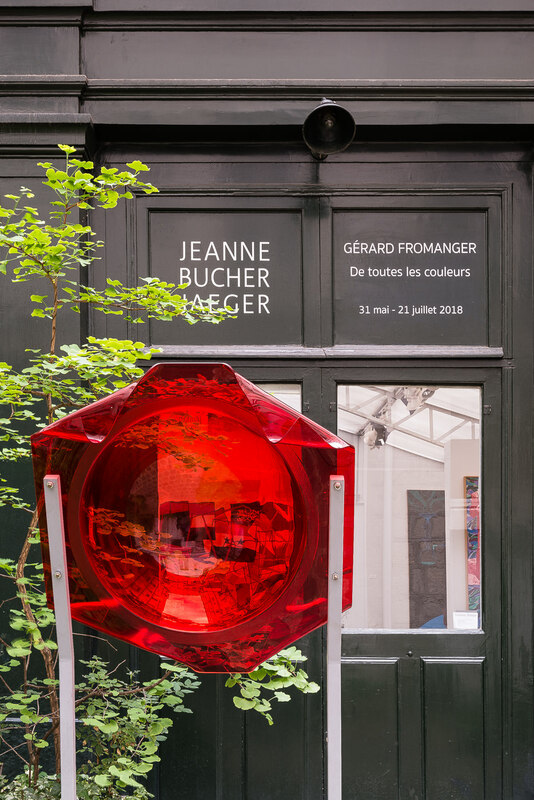 This series became the focus of the second solo exhibition of the artist at the gallery Jeanne Bucher Jaeger in 1975. One of the artist’s longtime friends, the philosopher, Michel Foucault, wrote the preface to the exhibition catalogue. 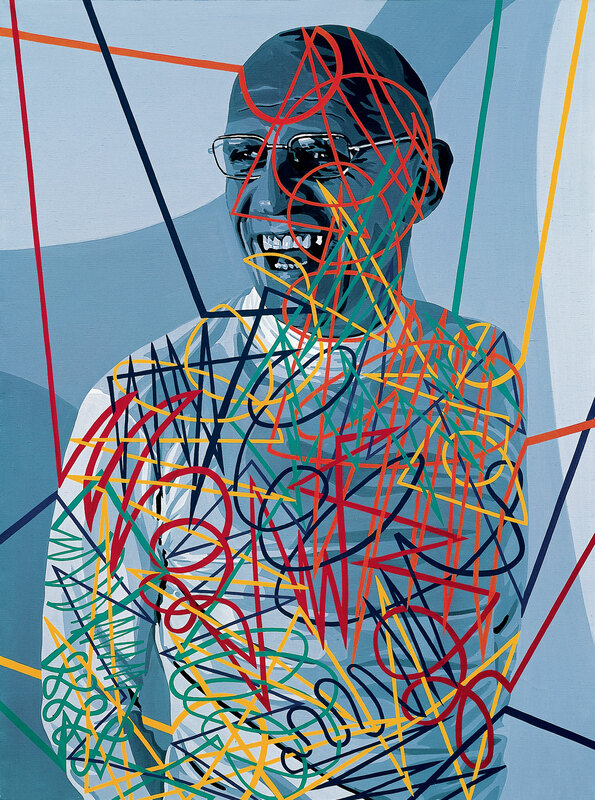 The philosopher, represented in the portrait Michel (portrait of Michel Foucault), (from the series Splendeurs II, 1976) expressed himself as follows: The paintings of Fromanger do not capture images – they do not fix them – they pass them around. They bring them in, draw them in, open passages for them, shorten their paths, allow them to burn the stages and create them at full speed. The photo-diapositive-projection-peinture series has the function of ensuring the transit of an image by mere projection. 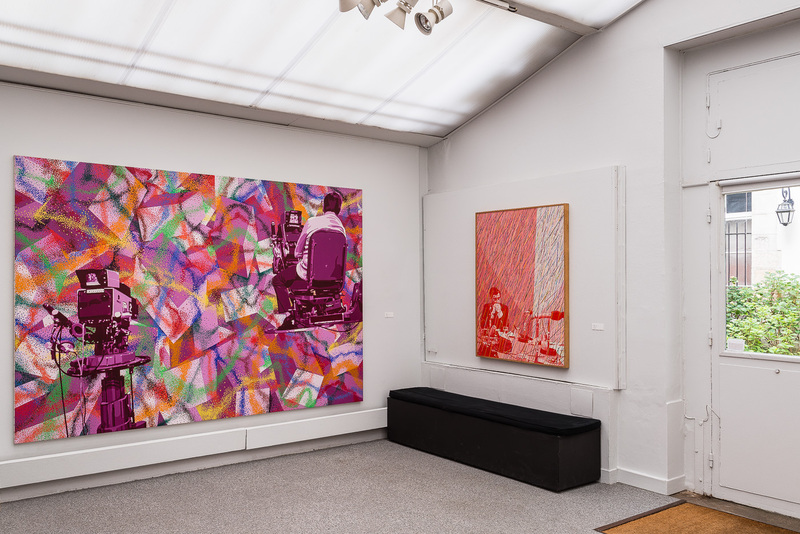 Each painting is a passage: a snapshot that, instead of being taken from the photograph of the moving subject, animates, concentrates and intensifies the movement of the image through its successive layers: Painting as a slingshot of images. 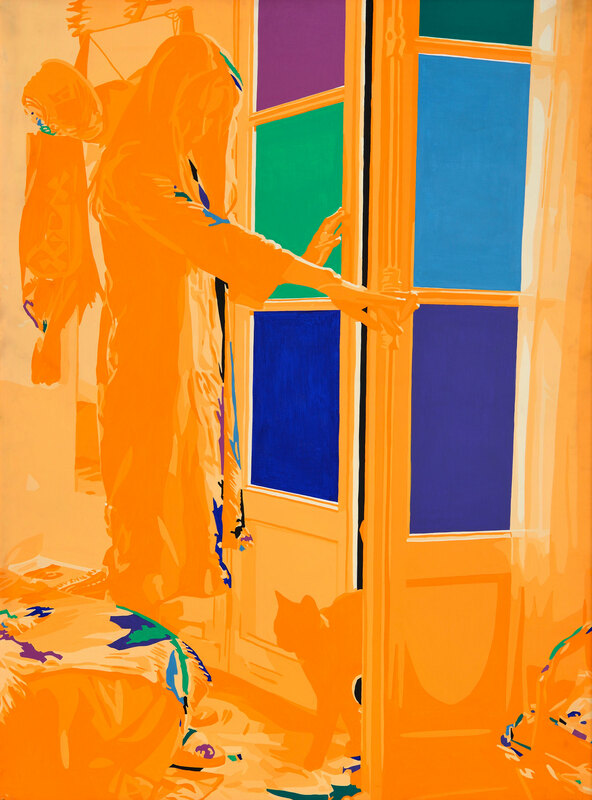 The painting Florence, le matin, 1976, evolves out of the series Splendeurs. It is a portrait of the woman he met in 68 and with whom he would share 10 years of his life. Much of the series is dedicated to her, alongside Sartre, Foucault and his old friend, Jacques Prévert. From 1965 (Pétrifiés) to 1976 (Questions), ten new series would see the light of day. 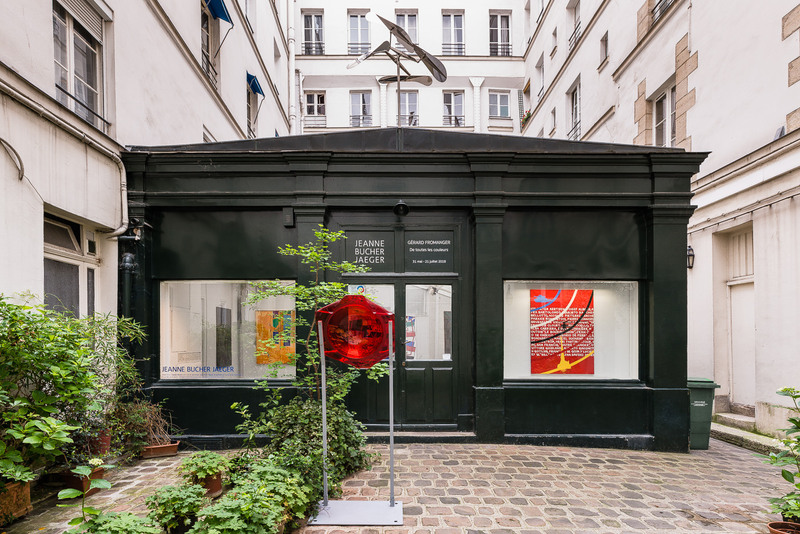 In 1977, a third solo exhibition was organized at the gallery, presenting the series Questions (Bouge, 1976, Danse, 1976 and Pleut, 1977 are part of it), in which each of the works is named with an active verb: moves , falls, exists, passes, springs, dreams, rains, dances, … . 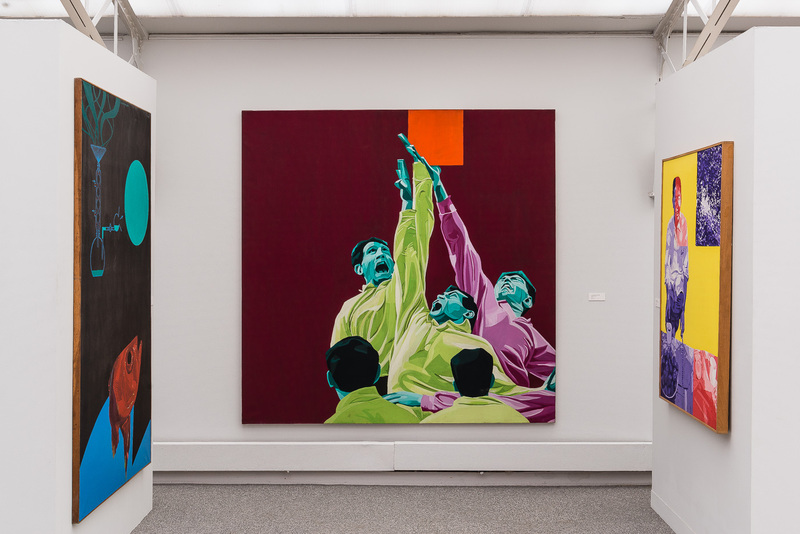 In the catalog of the recent exhibition of Fromanger’s work at the Centre Pompidou (2016), Michel Gauthier considers the painting Bouge as strategic to his oeuvre as it seems to contemplate the very distance it has taken with regard to a photograph’s authority. 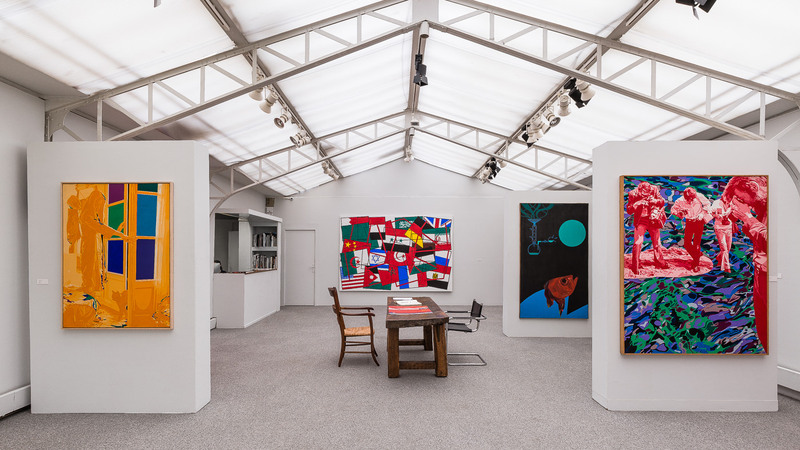 Between 91 and 95, Gérard Fromanger created the series Quadrichromies: five monumental paintings, a series of portraits, landscapes, and of twenty-five Batailles, which include the great names of the history of painting. This series, together with the series Rhizomes covers most of the 90s, and is deeply marked by the disappearance of Fromanger’s beloved companions: Jacques Prévert, Michel Foucault, Gilles Deleuze, as well as the artist’s parents. Dark years that call for black, just like the red that supremely dominated the year 68. 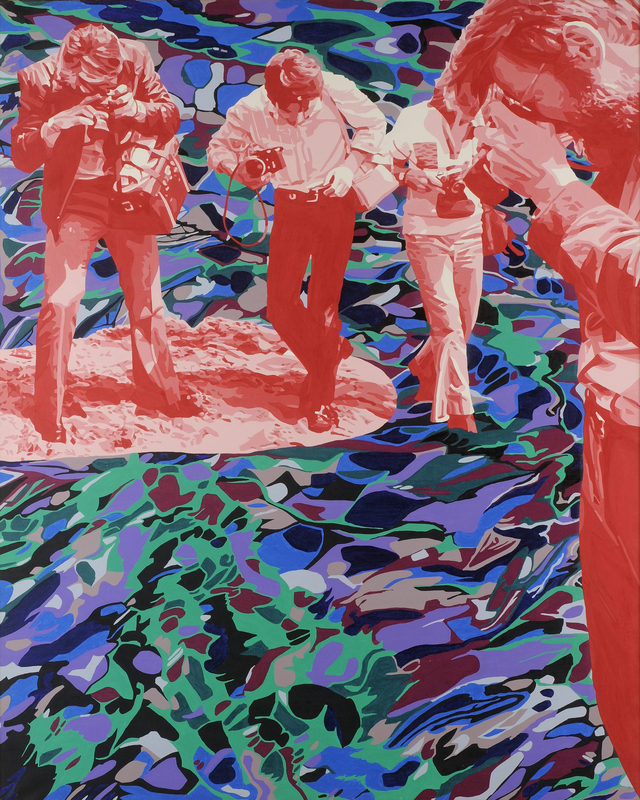 In 2011 the artist took up arms: what is beautiful about revolution is the desire for revolution, the first impetus. There it is magnificent. 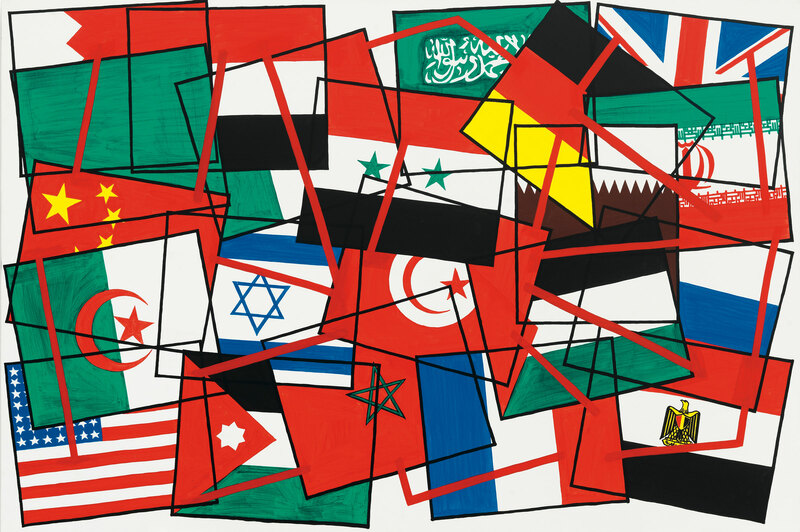 Look at the Arab Spring in its debut. The energy of the crowd in Cairo on the Tahrir square. “We cannot stand this anymore, get out! Too bad, kill us!” It’s beautiful, it’s magnificent. The desire for freedom in action in a country that has not been in turmoil for decades. It made me create a painting that I called Hommage à Gustave Courbet, de la Commune de Paris à la place Tahrir, 2011. 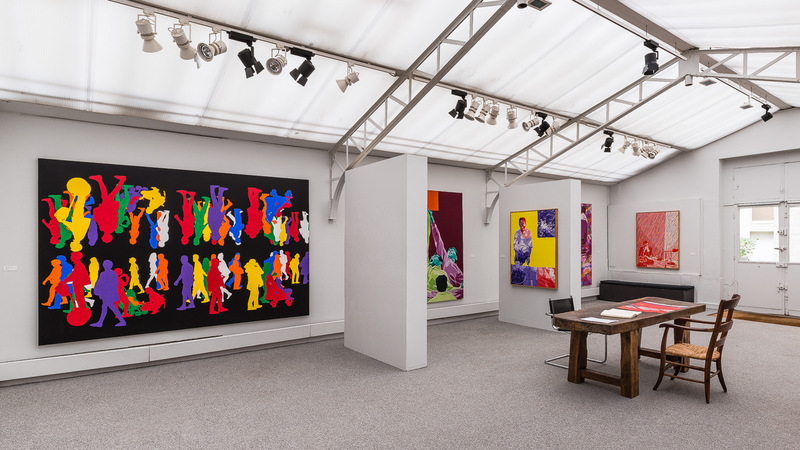 The multitude, preferred subject, inspiration, and fascination of the artist, appeared as of 1971 when Gérard Fromanger and Elie Kagan made what amount to snapshots of the street, on the Boulevard des Italiens. As Serge July put it: The street is caught in an invisible cloud of lava whose only tone changes according to a color chart of light that takes the whole solar spectrum: red, orange, yellow, green, blue, indigo, purple, white and black. Only passers-by escape this petrification: they are saved from disaster by their being «red», by the «red mark» of which they are universally carriers. Color will only return in 2017 with the Sens dessus dessous series, to which the painting Carbon noir (2017) belongs.